Orders are processed Monday through Friday, please allow 1-2 business days for order processing. Orders are shipped using FedEx. During the holiday/bowl game season please allow an additional 1-2 business days for processing. FedEx Ground packages are not picked up from Old State Clothing Co. nor delivered to on Saturday/Sunday. Shipping costs are based on the package weight as well as the destination. Credit Cards will not be charged until the items have be pulled from stock & are ready to ship. Items selected for purchase are subject to availability & if they are not currently in stock the customer will be notified with in two business days by email & or a phone call with a suggested substitute item or an anticipated back order date. If the store does not hear back from the customer regarding this email & or phone call within five business days the order will be canceled due to customer inactivity. With your return please include your original order number (this will be on your invoice in your package), the full name that the order was placed under, & a phone number where we can reach you. Your items will be refunded to the credit card used for the original purchase. All items being returned must be in original purchased condition.(I.E. Pet Hair Free, Smoke Free & Tags Attached) Shipping costs can not be refunded & returns are subject to a re-stocking fee. ALL RETURNS/CLAIMS MUST BE DONE WITHIN 30 DAYS FROM PURCHASE. If you would like to exchange an item please follow the return instructions above but include the item that you would like in exchange for the return (include the size & color if it applies). If you are sending an exchange we suggest contacting us first to check on the availability of the item you would like, it will also be held for you so that it is guaranteed to be available for you when we receive your exchange. Exchanges are subject to a new shipping fee. Failure to do any the above mentioned may delay refunds & or exchanges. 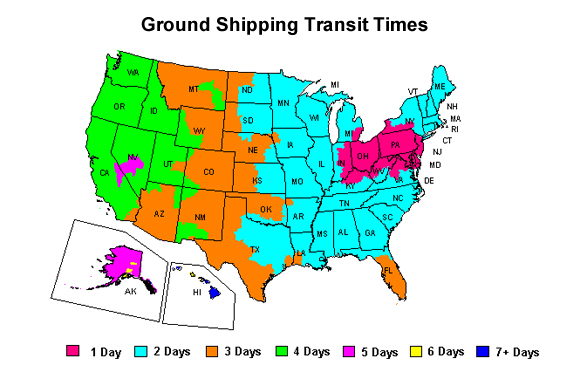 This map illustrates service schedules in business days as of January, 2017 for USPS Ground shipments only. These business days do not include Old State Clothing Co. processing time. USPS Ground business days are Monday through Friday (excluding holidays). USPS business days are Tuesday through Saturday (excluding holidays). Example: A package shipped via USPS ground on Monday with a transit schedule of 2 business days, (not including the day the package is shipped) would be expected for delivery on Wednesday. A package shipped on Friday with a 2-day transit schedule would be expected for delivery the following Tuesday.